Two-ply, nonperforated, 12" dia. roll. White, 3.5" wide x 2,000-ft. roll. 6 rolls per case. Outstanding quality and softness. Safe for sewer and septic systems. White, unscented 4.3 x 4.4 sheets. 176 sheets per roll. 4 rolls per pack. 24 packs per case. Outstanding quality and softness. Safe for sewer and septic systems. 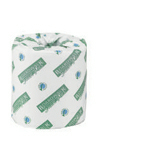 White, unscented 4.3 x 4.4 sheets. 200 sheets per roll. 4 rolls per pack. 10 packs per case. • Soft, white, biodegradable • Individually wrapped rolls • EPA Compliant for minimum post-consumer recycled fiber content High-capacity roll. 1,000 sheets per roll. 48 rolls per case. 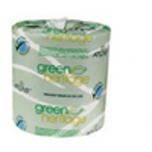 • Soft, white, biodegradable • Individually wrapped rolls • EPA Compliant for minimum post-consumer recycled fiber content 550 sheets per roll. 80 rolls per case. The ideal balance of strength, softness, absorbency and economy. Meets EPA standards. Minimum 20% post-consumer material. White, 4.1 x 4.0 sheets. Environmentally conscious. Embossed for softness, 100% recycled Boardwalk® Green Green Seal-certified bath tissue contains up to 49% post-consumer waste, which exceeds United States EPA guidelines.